What do we look for when it comes to online slots? Graphics, maybe, what about the music, I’m not sure. Could it be the slots theme, do we really care about Cowboys and the Wild West when playing casino games? According to Net Entertainment, we do. 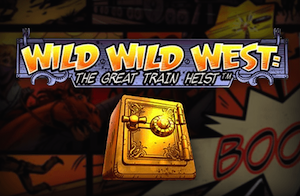 The Wild Wild West Slot: The Great Train Heist is a 10 pay line free spin frenzy with lots of Wilds in its holster. It’s got a long title, but is the game any good? £20 welcome bonus with only 5x the wagering! It’s Net Entertainment, It’s Western and it’s shooting Wilds from the hip on all 5 reels. Forgive me, but I can’t say that Wild Wild West: The Great Train Heist is better than Dead or Alive (Older Western Net Entertainment Slot). However, there are some good things in the saddle. You can play from just 10p a spin, you can win up to 60 free spins in the ‘Wild Overloaded’ bonus game and it’s a mobile slot too. The jackpot of 500 times your stake is attractive and there’s a pick and click feature for added firepower. But with just 10 pay lines, The Wild Wild West Slot could leave a narrow trail for wins and the slots highest bet is limited to £100, not good for the high roller spin slingers amongst us. So who will like this game? I suspect anyone who owns a pair of cowboy boots or does not mind playing lower limit real money slots! I’ve read lots of slot reviews about Wild Wild West and there’s plenty of talk on good graphics and fantastic gameplay. Let’s remember what we’re looking at, it’s a slot game so in 2017 we can expect the visuals, but gameplay needs a tough telling off. Essentially you’re spinning 5 reels to win money, that’s if you’re playing for real money. So how does Net Entertainment offer the winning possibilities in Wild Wild West: The Great Train Heist? Answer, you take a Wild Selector Wheel, load it with free spins and use 4 western villain characters to give them out. It works, playability is ok but the music is agonising. To win, we need to line up symbols that look identical. In Wild Wild West: The Great Train Robbery Slot (and let’s hope it is a robbery) those symbols are surprisingly western-themed. Credit to the cartoon illustrations and animation, it looks spanking as online slots in 2017 should be. To win the big money, look out for the 4 villains with the damsel paying highest at 500 coins. The slots jackpot (also 500 x your stake) is all four wild symbols (need to be the same) whilst the bonus ‘7’ and the golden safe trigger the games features. Western-themed card value symbols fill in the gaps and are the slots lowest paying symbols. Ok, if we’re winning money then we do it here. 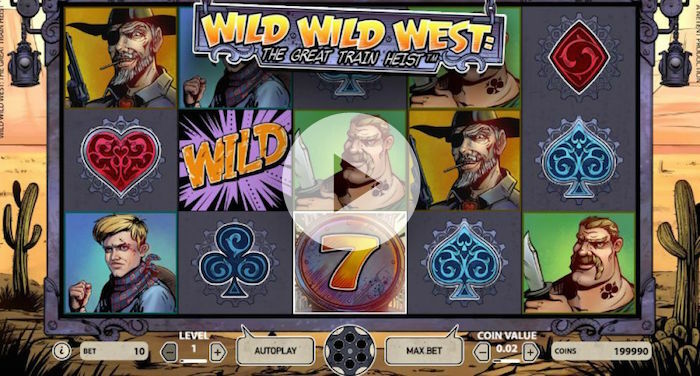 Wild Wild West: The Great Train Heist offers two bonus games, pick and click and a free spins feature. In this slot review, I’m going to keep things short and sweet. Net Entertainment know a good bonus game, and whilst in The Great Train Heist we don’t see their best effort, you can win up to 60 free spins playing this one. So how do these features work and how do we find them? Pick and Click features are basic, they’re boring but sometimes they can be brilliant. It’s a simple concept, even almost child-friendly, you pick, you click and hopefully you win something worth picking and clicking for. Enter the safe symbol, line these up on reels 1, 3 and 5 simultaneously and the slots second best bonus feature activates. When it does, choose wisely. Or at least as best as you can when facing a pretty clever mathematics algorithm. If you’re playing for real money and high stakes, Pick and Click can be useful with prizes between 5 and 50 times your betting stakes hiding in the safes. The free spins game is essentially just that, and although the Wild Wild West Slot uses different Wilds to good effect. It can feel plain. Other UK slot reviews talk about the storyline and 4 great western character villains, but I don’t see it. What I see is three blokes and a woman, I see Net Entertainment spinning their Wild symbols in very similar but also different directions. Play it and you’ll see what I mean. Still, with up to 60 free spins it’s worth telling you about. The Wild Wild West Slot Free Spins Bonus is controlled by the “7” symbol (scatter) that activates if three or more of these “7” symbols appear anywhere on the reels. 3 scatters award 10 free spins, 4 scatters 20 free spins and 5 scatters 30 free spins. But that’s not enough. Where are the Wilds? Bring forth the Wild Selector Wheel that spins to reveal which wild modifier extra is in play for your free spin games. Regular, Expanding, X2 Multiplier and Spreading Wilds are the 4 different winning power symbols that can help you with your heist efforts. A key point to take from Wild Wild West: The Great Train Heist Slot is that you can win up to 60 free spins by re-triggering the 30 free spins game. This is good for a 10 pay line slot. The Net Entertainment Wild Wild West Slot works with 10 fixed pay lines and betting ranges of 10p to £100 per spin. High Rollers might look elsewhere but most real money slots players can get what they need here. The 500 coin jackpot (50 x your betting stake) is strong for 10 pay lines and a 96.75% payout rate (RTP) makes it competitive. Is this the Great Train Heist that Net Entertainment want us to believe it is, some might be lucky enough to see it? But most will hear that traumatising western music on loop. Is it really a slot with amazing features, or does Wild Wild West go Wild Wild Wild with too many Wilds? Here’s what I’m thinking. At just 10p a spin, real money slots players get a slim chance at robbing their online casino of its loot, getting the girl (not really) and riding off into the sunset (most players play at night? ).